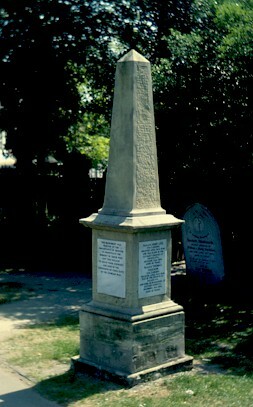 In the Churchyard at Beeston, by the path near to the Church Street entrance, stands a memorial to the men from the village who died in the Crimean War. Memorials to that war are very unusual and this one at Beeston is almost unique in terms of its format and for a community of this size. Elsewhere, there are larger scale memorials in more urban centres - notably in London, Sheffield, Southsea and at Bath Abbey - several regimental memorials, some at public schools and other institutions, personal memorials, several commemorative windows - including one in St Marys, Nottingham - and plaques and stones inside churches - such as the remembrance stone at North Collingham, Nottinghamshire. But, only the memorial at Southam, Warwickshire, another at Holywell in Wales and one at Balmaclellan, Scotland appear to be outdoor memorials of a similar format and on the same scale in a community of a similar size to Beeston. On this page, we explore the circumstances and personal bravery that led to this expression of local remembrance which has endured for over 150 years. A Little About the Crimean War - This war began in 1853, with British and French involvement from 1854, and lasted until 1856, fought between Russia and an alliance of Britain, France and Turkey (and Sardinia from January 1855) over competing claims for influence - both territorial and religious - in the Middle East, notably the Holy Land, then part of the Turkish Ottoman empire. There were also concerns over threats to British and French trade routes in the region, from Russian attempts to control Constantinople and to establish direct access to the Mediterranean. These complex reasons are now often forgotten, with most people today remembering two memorable aspects of the war - The Charge of the Light Brigade and Florence Nightingale's heroic efforts in caring for the sick and wounded. In fact, both were symptomatic of a fundamental problem within the British Army - maladministration on a large scale which became only too apparent in the Crimea. resulting in tragic operational blunders and - even more significantly - dreadful conditions for the British troops, resulting in terrible suffering and large-scale disease. It was a war where disease - typhoid, typhus, cholera and dysentery - killed many times the number who died from battle wounds - and the resulting public outcry made this failure the legacy of the war which was remain in the public conscience for many years. Although it took over 50 years and many enquiries, change did result - particular in the field of medical care. As a result the Army was, mercifully, better able to cope with the terrible casualties from the wars of the 20th Century. The British and French expected a quick victory when they assembled their invasion force at Varna in Bulgaria. Together with Turkish troops it numbered over 60,000 troops. A principal objective was Sevastopol, the main Russian naval port and the key to naval power in the Black Sea and Russian access to the Mediterranean. Although the landings were unopposed, shortcomings in provision for the troops were immediately evident. For the first time in any war, the telegraph enabled correspondents, notably William Howard Russell for The Times, sent back graphic - and worrying - reports of shortages of tents and medical facilities and deficiencies in transport arrangements. The evident organisational shortcomings soon led to outcries at home. The first major encounter, the Battle of Alma on 22 September 1854, notwithstanding these underlying problems, and despite chaotic allied command during the battle itself, resulted in a rout of the Russian forces who fled in complete disarray - but still managed to retain control of Sevastopol. The British established themselves at Balaklava, the French at Kamiesch, both to the south of Sevastopol, in a somewhat imperfect siege of the city. Allied bombardment of Sevastopol commenced on 17th October 1854, followed by a major attack by the Russians on the 25th. There followed the Battle of Balaklava, south of Sevastopol which was to be ever remembered for the infamous Charge of the Light Brigade. Early clashes were successful in beating off Russian attacks, firstly when two companies of Highlanders fought off a Russian cavalry attack with what was graphically described as "a thin red streak, tipped with a line of steel" by Russell in The Times - a line that led to the action becoming known as "the thin red line". When the Russian forces began to regroup, a charge by the Heavy Brigade of cavalry was successful in driving them back. Their followed the infamous Charge of the Light Brigade which, characterised by a series of ambiguous and imprecise orders issued and misinterpreted by the senior command was a disaster for the 673 men who were decimated by Russian artillery arranged on the hills on both sides of the valley in which they charged; over 100 of their number died. On 21 October 1854, Florence Nightingale headed a team of 38 volunteer nurses to the Crimea. At the barrack hospital at Scutari, she found extremely bad conditions, a shortage of medicines and medical supplies, hygiene being neglected and poor food and catering. Not surprisingly, infections were common and often fatal. She set about establishing better standards of cleanliness and patient care but the understanding of the cause of infections was not fully developed and it was not until some six months later, after the sewers were flushed and ventilation improved, that her efforts were rewarded with a dramatic decline in patient mortality. Later, using her interest in statistics, she was able to make the link between disease and lack of cleanliness which she was able to use to help change attitudes to care in Army hospitals and in their design. This was to have an important, long-lasting effect within the Army and beyond. In the winter that followed, the failures of provision of food, shelter and medical supplies were cruelly pronounced and many died of exposure, malnutrition and sickness. Although supplies did begin to arrive later in 1855 they were too late to save the many who had suffered and died - and too late to placate public opinion at home. In the face of this adverse feeling, a vote of confidence led directly to the fall of the Lord Aberdeen's Government which had taken the country into the War and which was held ultimately responsible for the organisational failures and poor conditions. 1855 was characterised by several attacks initiated by both sides with little progress. However, on 8th September 1855, what became the final attacks on Sebastopol took place. Although the British assault on the Redan failed, the French were successful at the Malakoff. The Crimean War was effectively at an end, a position formalised at the Treaty of Paris with Russia losing her dominance in the Balkans and agreeing to the integrity of the Ottoman Empire. 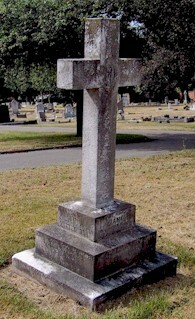 Sergeant William Jowett, the son of Enoch and Jane Jowett, was born at Breaston, Derbyshire on 9th January 1830. When he was about five, his parents moved with their family to Beeston seeking work in the lace trade. When he was 12, his mother died leaving his father with seven children. Two years later he married again and, five further children were added to his family. After a typically unhappy experience as a child worker in the lace trade, and not wishing to be burden on the family, he set off from Beeston to seek other opportunities and soon settled for a career in the Army, enlisting on January 8th 1847. Click to read his Diary and letters - from where a full family genealogy can be accessed. Private John Lees, born about 1824, appears to have been the son of James, a boatman, and Hannah, his wife who lived on Church Lane, Beeston.1 In 1841 he was a brickyard worker but enlisted in the Army on 26 April 1846. 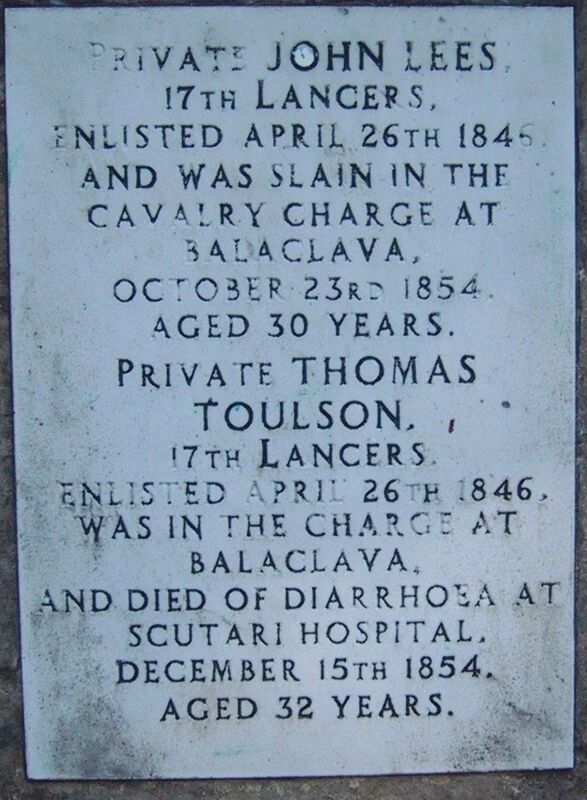 As a private in the 17th Lancers, he took part in the famous cavalry charge at Balaclava and was killed in action, aged 30 years. Although the memorial gives the date as October 23rd 1854, the more likely date was two days later when the famous charge of the Light Brigade - which included the 17th Lancers - took place. There seems little doubt that the extreme circumstances of this war - rapidly relayed, for the first time, by war correspondents - must have had a profound effect on the population back in Beeston. But it was probably the account, written so vividly in his diary by William Jowett, that brought about a determination to erect this permanent memorial to its fallen sons. While, no doubt, some - not understanding - may be tempted to smile at the description of two of the deaths, those who do understand the men's bravery and dedication, despite the conditions and the squalor, understand the reality and the awfulness they suffered. This would have been the motivation of those who were determined to remember their dead. We hope sincerely that this account assists in the same understanding and proper recognition today, of those from Beeston who served and suffered in the Crimea. 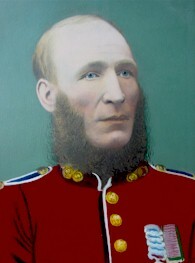 When he landed in the Crimea he was a "raw-un" or recruit, and one of the older soldiers thought he could impose on the young man from Nottinghamshire, so he stole Oldham’s rations, but, young as he was, Oldham could stick up for himself, and fought the thief for three hours until they were both black and blue. Col. Hoften coming on the scene stopped the fight, remarking "you have come out to fight for Queen and Country and not to kill each other." He was to go on to fight at Alma, was present at Balaklava. Inkerman and Sebastopol, receiving the Crimean medal with four bars and the Turkish Medal. 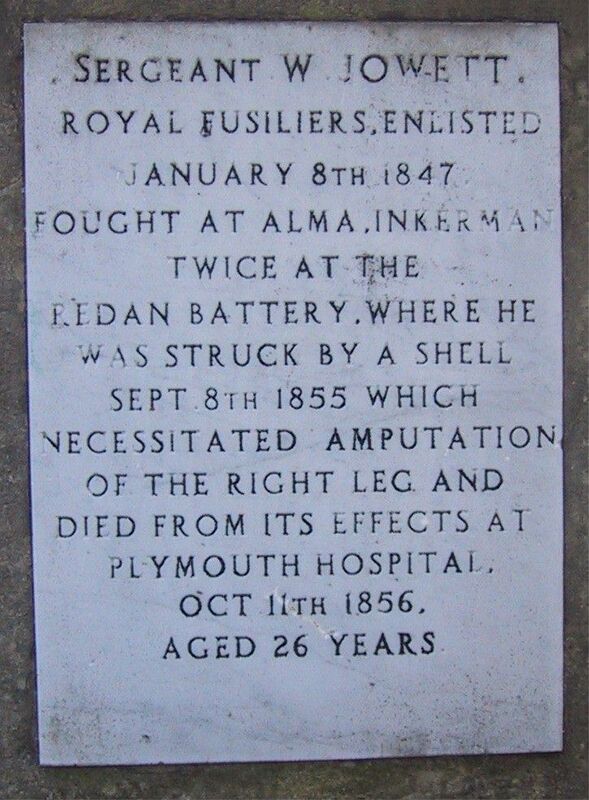 At Inkerman, that memorable "Soldiers’ Victory," - when "7,464 English troops and 8,219 French, or 15,683 in all, defeated the Russians completely, although they numbered 120,000" - Oldham was wounded three times, but he, with his comrades, fought on through attack and counter attack; it was a hand-to-hand fight, and "one of the most memorable feats of arms accomplished by British troops - taking rank with Agincourt. Plassey, or Waterloo". On another occasion, during the assault on Sebastopol, the enemy attacked and were repulsed, the Coldstreams were so earnest in the attack that Oldham and some others pursued them into the streets of Sebastopol. As Oldham said, "If we had not been ordered to retire we should have taken the place." 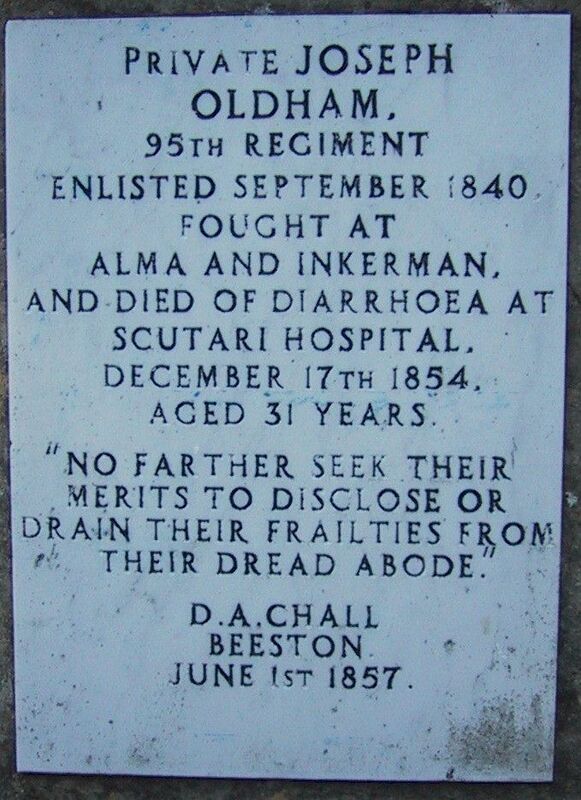 On one occasion, when Florence Nightingale herself became ill while in the Crimea, Oldham was one of a party of six from the Coldstreams who carried her to Castle Hospital. Later in life he would recall her qualities, "She was a grand lady to us soldiers, a regular mother, so kind, so gentle, and we often wondered if she ever went to sleep, because she was always at work among the sick day and night. We were glad to hear of her recovery." While serving in the trenches Oldham was severely wounded in the left foot which resulting in his discharge on a pension of 8d per day.7 He had served in the Army for 1 year 114 days. On his return to Beeston, the inhabitants of Beeston presented him with an arm chair with a suitable inscription on a silver plate. He had been very lucky to return, for after the battle of lnkerman he was the only one left in his tent, and out of 500 who marched to meet the enemy only 32 men and three officers returned. Robert married Jane Hufton in 1857 and together thay had ten children, all but one living into adulthood. He found work at the silk mill in the village. 11841 Census : Beeston Notts - Piece 856, Folio 14-44. His parents and the older children - including John - were then recorded as born outside of Nottinghamshire, possibly in Long Eaton, Derbyshire where it is known (from later census entries) that his mother was born. 3Florence Nightingale had arrived at Scutari in October but had not yet been able to control or rectify the problems, mainly of sanitation, that were then causing widespread deaths there. 4Joseph & Elizabeth are to be found in the census of June 1841, living there with their three then surving children (Piece 856 Folio 15-09); this included the 17 year-old Thomas who, like both his parents and both his siblings, was then working as a framework knitter. Thomas was baptised at Beeston Parish Church on 16th May 1824. 51841 Census : Beeston Notts - Piece 856, Folio 14-51. The Poor Row was situated to the east of the churchyard. 6His enlistment date and other anecdotes and details from Robert Oldham's Army service and his retirement are derived from an obituary published by (the Nottingham Branch of) the The Crimean & Indiam Mutiny Veterans' Association at the time of Oldham's death. 7Just over 3p in today's money - but with a present-day spending power of about £15 a week. On the recommendation of Major G Fellows, J.P., Treasurer of the Local Association, it was increased in 1900 to 10s 6d per week for life (about 52p - with a spending power of over £40 a week. 8The obituary describes him as "the last surviving Crimean Veteran left". It is not clear whether this is nationally or in the Nottingham branch. A pamphlet marking the 140th anniversery of the end of the Crimean War, with notes on the war and extracts from the Jowett diary and letters and from Robert Oldham's obituary.